We're getting ready for another school year so this issue is a bit earlier than usual. We have school shopping (clothing and supplies) to take care of for the next few days. School starts early around here... August 5th. Summer is never long enough. (some responses included in the Feedback Section of this issue. I really appreciate those of you who took the time to email me. I had alot of helpful ideas. It is crocheted and it sort of "finishes itself off" as you are working it. It just folds over into a triangle for use as a potholder, or you can stitch it together. An elderly lady tried to give me the pattern, but she had alzhiemer's very bad and has since passed away. Lisa I so look forward to your newsletter each time, so informative. Some of the gals in our crochet class would like to find cable crochet hooks with hooks on each end. Joann.com has what are called circular crochet hooks (40"). This is my commandment, that you love one another, just as I have loved you. Greater love has no one than this, that one lay down his life for is friends. You are My friends, if you do what I command you. Cast your burdens upon the Lord and He will sustain you; He will never allow the righteous to be shaken. WHEN THE WHOLE WORLD HAS GONE OUT." and a hundred clusters of raisins and two hundred cakes of figs, and loaded them on donkeys? Pain in your hands when you crochet? Do your dishes before you crochet. enough to make crocheting a more enjoyable experience. 69. Take some nylon net and cut it into strips about 1/2 to 2/3 inch wide and then crochet both the yarn and net into a square of about 3" wide and long. These make great scrubbies for kitchen and bathroom cleaning. An easy way to cut the net is to roll it and then cut off desired width. You have my permission to make items to donate OR sell. 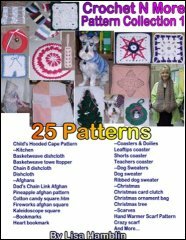 All I ask is my actual pattern(s) not be sold. 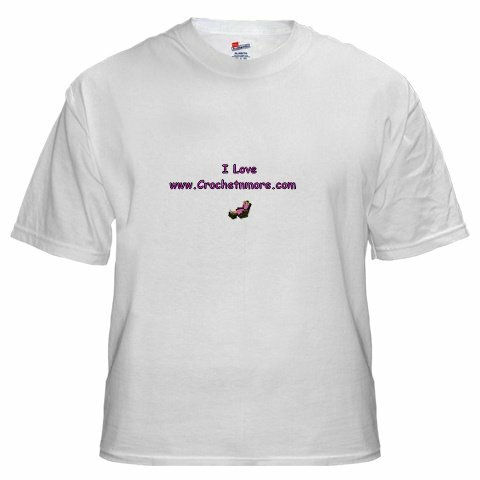 Including a link to my website with each item made is always appreciated. I just wanted to say I love the look of the Boa Scrunchie. It looks cute, yet elegant. I give it two thumbs up. I am relatively new to crocheting and am working on a project where I can't quite comprehend the instructions. If you would be able to help at all, I would greatly appreciate it. Ch 3 Row 1: 3 hdc in 3rd ch from hook - 3sts. Thanks for your time and all your help! That is at the end as a reference. Once you finish that instruction you should have three stitches (3sts). Thank you for creating this great pattern. I did want to mention that I always seem to need to crochet a few more rounds than your pattern calls for, and I am not sure if it is because of the size of the toilet paper rolls we use, or my crochet tension or what, so I thought I'd write and tell you what I usually do, in case you'd like to include it in your pattern directions for others who might have the same issue? :) Where you say Rounds 8 to 15, I just make that Rounds 8 to 18. Then Your Round 16 becomes my Round 19, and your Round 17, becomes my Round 20. Just thought I'd write and see if this might help others out that might need it. Hope this helps, and have a blessed day! Thanks again for sharing such a pretty pattern. I don't know how many to chain at the beginning of the waist. You can't just chain 4 and have it fit the doll. Maybe I'm missing something. You aren't missing anything... this pattern just isn't made in the traditional way. The band is made first... width wise. Then the skirt is added on. Hi I was trying to print out your pattern but had several problems. I am interested in learning easy patterns and this one looked good. I hope that you can send it to me. I was told on line it was a free pattern. Thanks for your help. you should be able to print the pattern from there. If not please let me know and I'll copy it into an email for you. I am so sorry that some one took offense at your terminology. I have always found the patterns on this link easy to understand and I am self taught. I have given some thought to what you might say and wonder if saying "unabreviated" might soothe the waters? Polly G.
I'm so glad you love the loaf pan tote. I'm sorry to say that I have yet to design a carrier for regular casserole dish. "But God, being rich in mercy, because of His great love with which He loved us, even when we were dead in our transgressions, made us alive together with Christ (by grace you have been saved), and raised us up with Him, and seated us with Him in the heavenly places, in Christ Jesus. Leviticus 19:18"
I have since changed the reference on that verse. I use the prior newsletter as a form for the new one and sometimes human error haunts me. By all means, please do email me if I get a reference incorrect in future issues. So glad to know you are enjoying the newsletters. 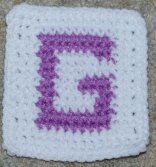 I am working a border around a baby afghan and have come across an instruction I don’t understand. It says “Ch 4 sc in dc, miss 3 sc in next dc.” What does “miss” mean? It does not say ‘skip’. Does it mean skip? Please let me know if you understand what it is trying to tell me to do. Thanks. Yes, "miss" is the same as "skip". That means three double crochets, chain 3, 3 double crochets. stitches in the stitch indicated just after the closing parentheses. Hi there. I have just downloaded your pattern for the baby rattle but as I live in New Zealand could you please clarify for me what Bernat Baby Coordinates is? ie is it double knitting wool/cotton etc. Also size F hook and a basic idea of what a craft stick is. Bernat Baby Coordinates yarn is a soft, sport weight acrylic yarn. in case you need to determine a yarn substitute. Yes, another viewer caught my mistake also. Thank you so much for caring enough to let me know. I have since changed the reference in the last issue from Leviticus to Ephesians 2:4-6... and I also added a couple of other verses from 2 Corinthians. But God, being rich in mercy, because of His great love with which He loved us, even when we were dead in our transgressions, made us alive together with Christ (by grace you have been saved), and raised us up with Him, and seated us with Him in the heavenly places, in Christ Jesus. For the love of Christ controls us, having concluded this, that one died for all, therefore all died; and He died for all, that they who live should no longer live for themselves, but for Him who died and rose again on their behalf. I am glad you are enjoying the Bible Studies and happy that you cared enough to let me know I made a dreaded human error in the July 15th issue. 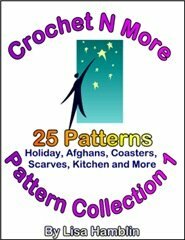 My newsletters will be published indefinitely as I love providing this service for my fellow crocheters. >>HDC chain 1, HDC in row 1. 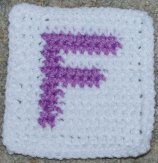 This sounds like you are working a half double crochet, then one chain... repeating that across the entire foundation chain to form Row 1. >>Then in Row 2 you make a HDC in the chain 1 space. To work a half double crochet in the chain 1 space... you work the stitch into the hole below the chain... not into the actual chain, itself. Sorry, I do not have any photos...hope this helps. I ALWAYS ENJOY YOUR NEWSLETTER THOUGHT I WOULD SHARE MY NEWSLETTER WITH YOU . "No, I really wish you had" he sighed. "I left the tickets on it." An elderly man went to the doctor for a visit. "Doc," he says," I am so stricken. I have chest pains, headaches, back pains, nausea, arthritis, constipation, stomach cramps, earaches, burning in the eyes, congested lungs..."
"Sir," says the doctor, "you complain you have so many things. What don't you have?" Dispatching her ten-year-old son to pick up a pizza, my sister handed him money and a two-dollar coupon. Later he came home with the pizza, and the coupon. When asked to explain, he replied, "Mom, I had enough money. I didn't need the coupon." "H20 is hot water, and CO2 is cold water." The next morning while they are eating breakfast, the young woman sees her neighbor hanging the wash outside. "That laundry is not very clean," she said. "She doesn't know how to wash correctly. Perhaps she needs better laundry soap." About one month later, the woman was surprised to see a nice clean wash on the line and said to her husband: "Look, she has learned how to wash correctly. I wonder who taught her this?" We eat so much wild game, in fact, that one evening as I set a platter of broiled venison steaks on the dinner table, my ten-year-old daughter looked up and said: "Boy, it sure would be nice if pizzas lived in the woods." A young woman wasn't feeling well, so she asked one her co-workers to recommend a physician. "Very good. Just continue the treatment I prescribed on your last visit." A doctor goes out and buys the best car on the market, a brand new Ferrari GTO It is also the most expensive car in the world, and it costs him $500,000. He takes it out for a spin and stops at a red light. An old man on a Moped, looking about 100 years old, pulls up next to him. The old man looks over at the sleek shiny car and asks, "What kind of car ya got there, sonny?" The doctor replies, "A Ferrari GTO. It cost half a million dollars!" "Because this car can do up to 250 miles an hour!" states the doctor proudly. So the old man pokes his head in the window and looks around. Then, sitting back on his Moped, the old man says, "That's a pretty nice car, all right... but I'll stick with my Moped!" Suddenly, he notices a dot in his rearview.. what could it be? He floors the accelerator and takes the Ferrari up to 175 mph. Then, up ahead of him, he sees that it's the old man on the Moped! Amazed that the Moped could pass his Ferrari, he gives it more gas and passes the moped at 210 mph. He's feeling pretty good until he looks in his mirror and sees the old man gaining on him AGAIN! 250 mph. Not ten seconds later,he sees the Moped bearing down on him again! The Ferrari is flat out, and there's nothing he can do! "Oh My! Is there anything I can do for you?" The old man whispers, "Yeah...Unhook my suspenders from your side mirror." "Well, what did you learn today?"